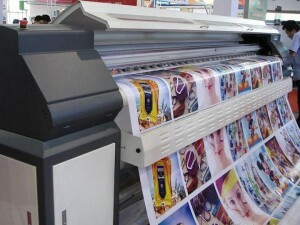 Wide Format Inkjet Printing: the pros and cons of different ink types. Anyone in the business of digital wide format graphics or CAD printing will know that there is more to wide format printing than meets the eye. There are many different types of wide format printing, including different inks and printing processes which are each suited to different applications. The following is what we hope is a helpful guide as to the key differences, pros and cons of the 5 main types of inks used in wide format printing. These are water-based (or ‘aqueous’) inks with the colorant dissolved like sugar in water. The advantage ofdye inks is that they offer high saturation, because the liquid ink is absorbed into the paper’s fibres. However, these inks have low UV and Ozone stability, which means the ink will fade more easily if the printed item is exposed to sunlight. Also dye inks are not water-resistant. Dye inks tend to be used for more basic applications such as printing CAD drawings or indoor posters. These are also water-based inks, but the colorant is made of tiny, encapsulated particles (pigments) which are suspended in the liquid like chalk. When applied to paper, the tiny particles of colour sit on top of the paper instead of being absorbed into the paper’s fibres like dye inks. Aqueous-based pigmented inks have high lightfastness and ozone resistance, and are generally water-resistant. However, they offer slightly lower saturation compared to dye inks. Printers using aqueous-based pigmented inks often use more colours and graduations (up to twelve ink cartridges) in order to compensate for the lower brilliance and to improve overall print quality. These inks are great for indoor posters and graphics, canvas prints and other fine art applications. They can also be used for short-term outdoor applications, or for long-term outdoor items if additional protection (e.g. lamination) is applied. These are also pigmented inks, but unlike the above, the liquid is chemical-based – i.e. solvent. Solvent inks are more durable and than water-based inks, are waterfast, and can be applied to other materials such as uncoated vinyl and PVC, as well as paper, canvas and other synthetic films. The disadvantage of solvent inks is the fact that they can be harmful to your health and the environment, due to the various gases released by the chemical-based liquid. Solvent inks can be used for a wide range of both indoor and outdoor graphic and display applications, including outdoor posters, signs, banners and vehicle wraps. Due to the odour created by these chemical-based inks, they are unsuitable for some indoor applications such as food retailers. Latex inks are like aqueous-based pigmented inks, however the difference is they also contain small particles of latex, which is a form of plastic. Once applied to paper, heat is used to evaporate away the water, leaving just the pigment and latex particles on the paper surface. At the same time, the heat activates, or ‘melts’, the latex particles and this encapsulates and binds the pigments to the surface. Like solvent inks, latex ink is waterproof, waterfast and can be applied to a range of media such as uncoated vinyl and PVC. However, the benefit of latex ink over against solvent is that it doesn’t produce any harmful gases or odours that are harmful to the environment. Therefore, latex is often viewed as an ‘environmentally friendly’ version of solvent. The main disadvantages of using latex inks is that, due to the heat involved in the process, there is currently a limited range of media on the market that is suitable for latex printing. Also, because the process involves heat it uses more energy, which of course ultimately has a cost implication. The liquid in UVC inks is aqueous-based, and the colorants are usually pigment-based but can also be dye-based. After printing, the ink is ‘cured’ or dried by exposure to strong ultraviolet (UV) light – hence they are called UV-curable inks. The key advantage of UVC inks is that they can be applied to pretty much any material you can put through the press – including rigid media such as plastics and foamboard. This is because there is no absorption of ink into the media, and neither is there need for liquid solvents to be left to evaporate. Instead, the ink dries on the surface as soon as it is cured, meaning it can be applied to non-porous substrates as well as paper. UVC inks are also waterproof, meaning they are great for outdoor applications. The main disadvantages of UVC inks is that they are expensive, the curing module required for the printer is also expensive, and the print quality is not as good as conventional water-based and solvent inks. Also, because of there is a high volume of ink on the surface, UVC inks are sometimes susceptible to cracking if applied to a flexible substrate. UVC inks are often used in flatbed printers whichprint directly onto rigid substrates, and are becoming increasingly used in “hybrid” printers to print onto flexible media such as paper and vinyl, as well as rigid substrates. Typical applications of UVC inks are for stiff media, outdoor graphics and general display and signage.